A candy Store and dessert bar in Bethesda, MD. Candy stores should be for kids from 1 to 100.
we do specialty bakery orders - call today! Capture the sights, sounds and smells so rich it’ll activate your tastebuds. Host an important celebration, enjoy your treat on our comfortable mezzanine or under our outdoor canopy or, if you dare, share a favorite song or two on karaoke. Hundred’s of candies and sweets, including sugar and gluten free, to satisfy a sudden urge or regular fix. Fresh fudge, your favorite hard or chewy candy, hand-scooped ice cream floats and shakes & very much more! Whether you have 4 quarters burning a hole in your pocket or are entertaining 250 people and want a memorable sweet, Henry’s has a special treat that will satisfy and make you smile. 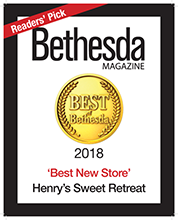 Henry's Sweet Retreat is a candy market and dessert bar in Bethesda, MD. Enjoy a healthy, sweet alternative! Sodas: Over 30 fun flavors! A great space to host parties & birthdays parties for all ages. or your work group wants to meet with a sweet, we have the perfect space! Henry's mezzanine seats 24 and is available for private events. Call for availability and details. Photo booth props – mom and dad’s feel free to snap away with our props! We are happy to provide pizza (Domino’s or Corner Slice) for an additional fee. Personalized and custom cakes and cupcakes available from Henry's pastry chef. Cookie decorating party includes each child shaping cookies from a ball of dough with cookie cutters, playing 2-3 games/activities while we bake them off and cool them down, and then decorating their cookies with frosting and candy/decorations - each child takes their cookies home in a personal box. Candy memory game – recommended for ages 8 and up. Try and memorize a tray of candy. Pin the Cherryl on the Cupcake – a classic favorite! Contact Us about Your Party! If inquiring about a birthday party please choose the date and time below. Saturday/Sunday starting at 10am, 12pm, 2pm and 4pm. / Weekdays available 12pm, 2pm and 4pm. Saturday/Sunday starting at 10am, 12pm, 2pm and 4pm. Weekdays available 12pm, 2pm and 4pm. $300 for up to 10 kids, $25 additional per child, maximum recommended is 16 kids (we can go as high as 22). 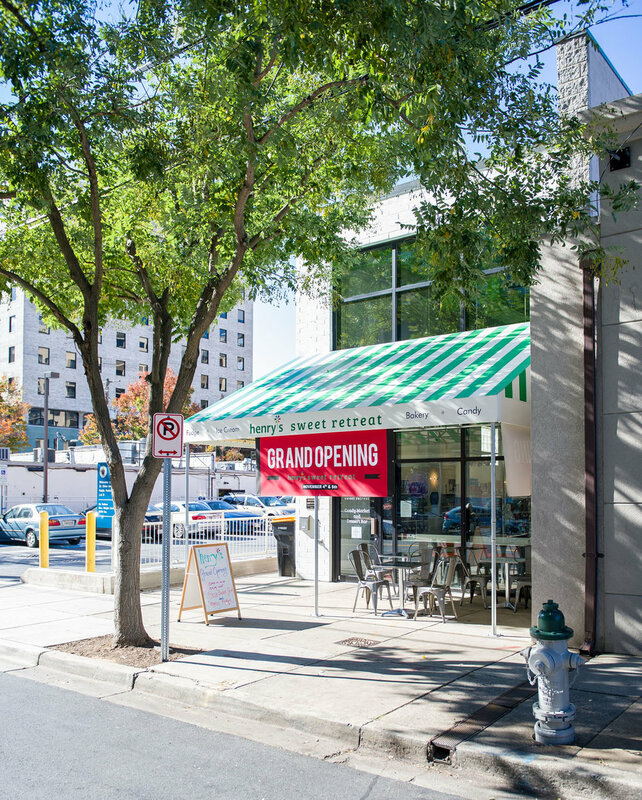 A modern version of a traditional candy store in the heart of Bethesda, MD. A special treat that will satisfy and make you smile. Our inspiration Tom's grandfather Henry Wagner. Tom's grandparents, Henry and Martha, raised their family in middle Ohio in a different era when grandmas baked homemade pies with cherries from Mr Starkey’s tree next door while grandpas smoked cigars in the living room while reading the evening newspaper. A big Friday night included a bucket of Colonel Sanders chicken and on the 4th of July, a town parade. When the grandkids were in town, Henry gave each a dollar to spend in town. Past the town fountain (sometimes filled with bubbles) they walked unsupervised across a busy road, where drivers stopped and waved, to what seemed like heaven on earth: the local five & dime. Henry’s Sweet Retreat was inspired in this vision. We hope you enjoy our modern take on a traditional candy store. Come try our store soon.